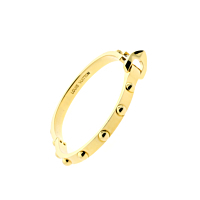 The Empreinte Gold Bangle by Louis Vuitton is a brilliant example of thinking outside the box when it comes to bracelet design. There are too many similar designs out there from other brands and that's why we've added this beautiful piece to our shop. This Bangle is a cut above the rest and if you're looking for something none of your friends will have, this is the piece.